One of the accomplishments expected of proper young girls was skill with a needle. From an early age they applied themselves either in school or under the direction of a female family member. Below are some examples of their embroidery. Not in the words of women, but this time in the hands of women. and the bird are obvious. 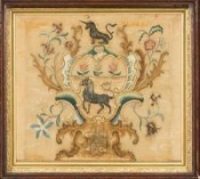 SARAH DERBY from Salem, Massachusetts, embroidered this silk and paint landscape triptych some time between 1763-1766 at the age 19 or 20. Owned by Winterthur. when she was 19 or 20 years old. 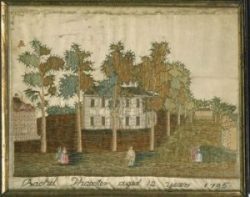 RACHEL THAXTER of Hingham Massachusetts embroidered the charming scene on the left in 1796 when she was only 10-12 years old. Owned by Winterthur. 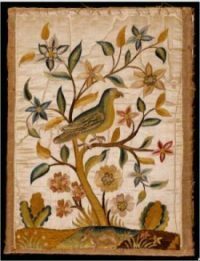 Do browse other examples of embroidery from this ARCHIVE.